The prisoners’ dilemma is the best known strategy game in social science. The game shows why two entities might not cooperate even when it appears in their best (rational) interest to do so. What is rational for the individual in certain circumstances is not rational for the group — that is, pursuing a strategy that is rational for you leads to a worse outcome. With applications to economics, politics, and business the game illustrates the conflict, which can sometimes arise, between individual and group rationality. Right now we can lock you up for 1 year. If you confess to the jewelery robbery and implicate your partner, however, we’ll give you immunity and you can go free. Your partner will get 20 years in jail. But if you both confess to the crime, we won’t need your testimony and we can avoid the cost of a trial, so you will each get an intermediate sentence of 8 years. If Mr Black and Mr Pink, heartless criminals that they are, care only about their own sentences, what would you expect them to do? Would they confess or remain silent? Each prisoner has two strategies: confess or remain silent. The sentence each prisoner gets depends on the strategy chosen by his or her partner in crime. I don’t know what Mr Pink is going to do. If he remains silent, my best strategy is to confess, since then I’ll go free rather than spending a year in jail. If he confesses, my best strategy is still to confess, since then I’ll spend 8 years in jail rather than 20. So, regardless of what Mr Pink does, I am better off confessing. In the language of game theory, a strategy is called a dominant strategy if it is the best strategy for a player to follow regardless of the strategies pursued by other players. In this case, confessing is a dominant strategy for Mr Black. He spends less time in jail if he confesses, regardless of whether Mr Pink confesses or remains silent. Now consider Mr Pink’s decision. He faces exactly the same choices as Mr Black, and he reasons in much the same way. Regardless of what Mr Black does, Mr Pink can reduce his time in jail by confessing. In other words, confessing is a dominant strategy for Mr Pink. 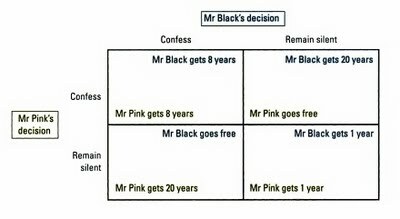 In the end, both Mr Black and Mr Pink confess, and both spend 8 years in jail. Yet, from their standpoint, this is a terrible outcome. If they had both remained silent, both of them would have been better off, spending only 1 year in jail on the gun charge. By each pursuing his own interests, the two prisoners together reach an outcome that is worse for each of them. To see how difficult it is to maintain cooperation, imagine that, before the police captured Mr Black and Mr Pink, the two criminals had made a pack not to confess. Clearly, this agreement would make them both better off if they both live up to it, because they would each spend only 1 year in jail. But would the two criminals in fact remain silent, simply because they had agreed to? Once they are being questioned separately, the logic of self-interest takes over and leads them to confess. Cooperation between the two prisoners is difficult to maintain because cooperation is individually irrational. The classic two-player example of game theory is the prisoners’ dilemma. We can recast the prisoners’ dilemma in a business context by considering a simple case of capacity addition. Say two competitors, A and B, are considering adding capacity. If competitor A adds capacity and B doesn’t, A gets an outsized payoff. Likewise, if B adds capacity and A doesn’t than B gets the large payoff. If neither expands, A and B aren’t as well-off as if one alone had added capacity. But if both add capacity, they’re worse off of than if they had done nothing. Consider two firms, say Coca-Cola and Pepsi, selling similar products. Each must decide on a pricing strategy. They best exploit their joint market power when both charge a high price; each makes a profit of ten million dollars per month. If one sets a competitive low price, it wins a lot of customers away from the rival. Suppose its profit rises to twelve million dollars, and that of the rival falls to seven million. If both set low prices, the profit of each is nine million dollars. Here, the low-price strategy is akin to the prisoner’s confession, and the high-price akin to keeping silent. Call the former cheating, and the latter cooperation. Then cheating is each firm’s dominant strategy, but the result when both “cheat” is worse for each than that of both cooperating. Warren Buffett provides some illumination as to how the Prisoners’ Dilemma plays out in business in the 1985 Berkshire Hathaway Annual report. But the promised benefits from these textile investments were illusory. Many of our competitors, both domestic and foreign, were stepping up to the same kind of expenditures and, once enough companies did so, their reduced costs became the baseline for reduced prices industry-wide. Viewed individually, each company’s capital investment decision appeared cost-effective and rational; viewed collectively, the decisions neutralized each other and were irrational (just as happens when each person watching a parade decides he can see a little better if he stands on tiptoes). After each round of investment, all the players had more money in the game and returns remained anemic. For an understanding of how the to-invest-or-not-to-invest dilemma plays out in a commodity business, it is instructive to look at Burlington Industries, by far the largest U.S. textile company both 21 years ago and now. In 1964 Burlington had sales of $1.2 billion against our $50 million. It had strengths in both distribution and production that we could never hope to match and also, of course, had an earnings record far superior to ours. Its stock sold at 60 at the end of 1964; ours was 13. Burlington made a decision to stick to the textile business, and in 1985 had sales of about $2.8 billion. During the 1964-85 period, the company made capital expenditures of about $3 billion, far more than any other U.S. textile company and more than $200-per-share on that $60 stock. A very large part of the expenditures, I am sure, was devoted to cost improvement and expansion. Given Burlington’s basic commitment to stay in textiles, I would also surmise that the company’s capital decisions were quite rational. Nevertheless, Burlington has lost sales volume in real dollars and has far lower returns on sales and equity now than 20 years ago. Split 2-for-1 in 1965, the stock now sells at 34 — on an adjusted basis, just a little over its $60 price in 1964. Meanwhile, the CPI has more than tripled. Therefore, each share commands about one-third the purchasing power it did at the end of 1964. Regular dividends have been paid but they, too, have shrunk significantly in purchasing power. This devastating outcome for the shareholders indicates what can happen when much brain power and energy are applied to a faulty premise. The situation is suggestive of Samuel Johnson’s horse: “A horse that can count to ten is a remarkable horse – not a remarkable mathematician.” Likewise, a textile company that allocates capital brilliantly within its industry is a remarkable textile company – but not a remarkable business. My conclusion from my own experiences and from much observation of other businesses is that a good managerial record (measured by economic returns) is far more a function of what business boat you get into than it is of how effectively you row (though intelligence and effort help considerably, of course, in any business, good or bad). Some years ago I wrote: “When a management with a reputation for brilliance tackles a business with a reputation for poor fundamental economics, it is the reputation of the business that remains intact.” Nothing has since changed my point of view on that matter. Should you find yourself in a chronically-leaking boat, energy devoted to changing vessels is likely to be more productive than energy devoted to patching leaks. Our discussion so far has focused on competition. But thoughtful strategic analysis also recognizes the role of co-evolution, or cooperation, in business. Not all business relationships are conflictual. Sometimes companies outside the purview of a firm’s competitive set can heavily influence its value creation prospects. Consider the example of DVD makers (software) and DVD player makers (hardware). These companies do not compete with one another. But the more DVD titles that are available, the more attractive it will be for a consumer to buy a DVD player and vice versa. Another example is the Wintel standard—added features on Microsoft’s operating system required more powerful Intel microprocessors, and more powerful microprocessors could support updated operating systems. Complementors make the added value pie bigger. Competitors fight over a fixed pie. Consider an oligopoly with two members, called Iran and Saudi Arabia. Both countries sell crude oil. After prolonged negotiation, the countries agree to keep oil production low in order to keep the world price of oil high. After they agree on production levels, each country must decide whether to cooperate and live up to this agreement or to ignore it and produce at a higher level. 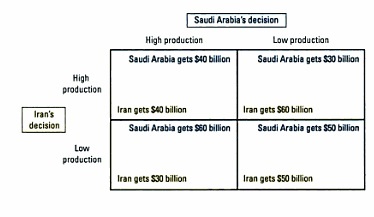 The following image shows how the profits of the two countries depend on the strategies they choose. I could keep production low as we agreed, or I could raise my production and sell more oil on world markets. If Iran lives up to the agreement and keeps its production low, then my country ears profit of $60 billion with high production and $50 billion with low production. In this case, Saudi Arabia is better off with high production. If Iran fails to live up to the agreement and produces at a high level, then my country earns $40 billion with high production and $30 billion with low production. Once again, Saudia Arabia is better off with high production. So, regardless of what Iran chooses to do, my country is better off reneging on our agreement and producing at a high level. Producing at a high level is a dominant strategy for Saudi Arabia. Of course, Iran reasons in exactly the same way, and so both countries produce at a high level. The result is the inferior outcome (from both Iran and Saudi Arabia’s standpoint) with low profits in each country. This example illustrates why oligopolies have trouble maintaining monopoly profits. The monopoly outcome is jointly rational for the oligopoly, but each oligopolist has an incentive to cheat. Just as self-interest drives the prisoners in the prisoners’ dilemma to confess, self-interest makes it difficult for the oligopoly to maintain the cooperative outcome with low production, high prices and monopoly prices. The Prisoners’ Dilemma is part of the Farnam Street latticework of Mental Models.